In the wake of the global financial crisis, amidst the ensuing austerity measures and continued rise of economic inequality across the world, there is growing recognition that tax policy matters for human rights. Realizing rights requires resources. Taxes remain the preeminent means through which governments raise revenues needed to deliver essential public goods and services and to protect rights. Moreover, taxation affects equality and non-discrimination, the bedrock principles of the human rights regime. Depending on how regressive or progressive tax policies are, they can alter the distribution of resources within and between countries, entrenching or alleviating social, economic and political disparities. Tax rules also serve to regulate conduct, encouraging or discouraging certain activities through repricing. Finally, tax policy, like human rights law, is at base about the relationship between individuals and the state. When designed and implemented well, taxes can reinforce representative democracy. Debates over tax policies and tax abuses have gained public prominence in recent years, with growing outcry over corporate tax scandals and the use of tax havens by wealthy elites to avoid paying their fair share. But there has been limited attention in legal scholarship and advocacy to the effects of these tax policies and practices on human rights, or to the implications of human rights law for the design and implementation of taxes internationally and domestically. Through applied research, legal analysis, advocacy before international bodies, and public conferences, the Center and the Global Justice Clinic have encouraged public debate and informed policy-making regarding the relationship between the international human rights framework and fiscal regimes, including taxation. As part of its Initiative on Inequality, the Global Economy, and Human Rights, the Center for Human Rights and Global Justice promotes interdisciplinary dialogue and research on the linkages between taxation and human rights. 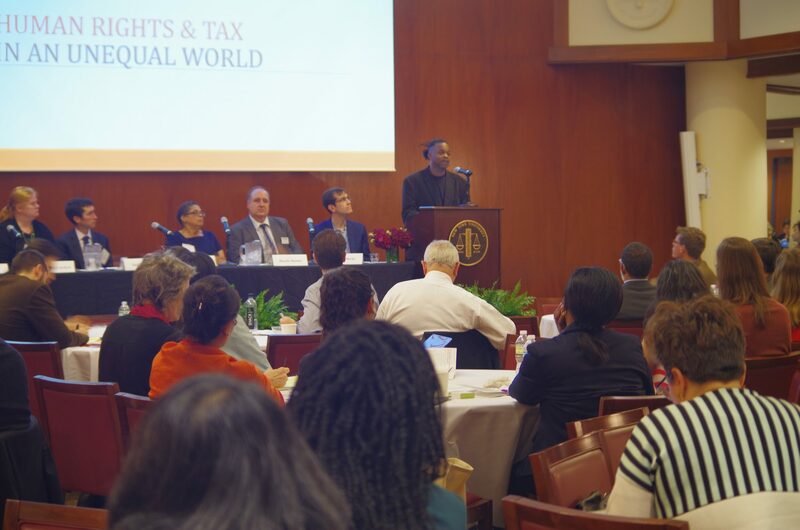 In September 2016, the Center organized a two-day, international conference on taxation and human rights at NYU, followed by a day-long workshop among scholars and practitioners on legal accountability for tax injustice. A selection of the academic papers presented at the conference will be published in a forthcoming edited volume from Oxford University Press. In conjunction with the Center’s efforts to enhance scholarly research and interdisciplinary dialogue on human rights and taxation, the Global Justice Clinic has worked to enhance state accountability for tax-related human rights harms and support legal reforms through advocacy at the international level. Together with partner organizations, including the Center for Economic and Social Rights and the Tax Justice Network, the Global Justice Clinic has successfully convinced international human rights treaty bodies, including the Committee on the Elimination of Discrimination Against Women and the Committee on Economic and Social Rights, to address tax laws and government facilitation of global tax abuse as part of their state party reviews. In his role as UN Special Rapporteur on Extreme Poverty and Human Rights, Philip Alston presented a report drafted by his predecessor, Magdalena Sepulveda to the Human Rights Council in June 2014, outlining the ways in which domestic and international tax policies implicate states’ legal obligations under human rights law. In his country missions and thematic reports, the Special Rapporteur continues to focus on fiscal policy as both a cause of and a potential solution to extreme poverty. Notwithstanding these and other recent initiatives, more critical analysis and cross-disciplinary exchange are necessary, both to sensitize the human rights community about why tax policy is human rights policy and to broaden the range of legal considerations and principles that tax experts bring to bear in designing and evaluating tax policies, including human rights obligations and norms.